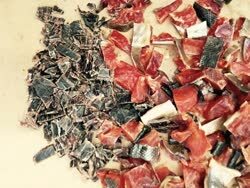 My 5-year-old panik Tiaksaq�s out on the land snack, dry fish and dry caribou meat, mipkku and piffi! Rita Tulumi'haq Porter fresh and yummy !!!! Cherie Qiyuk Kreelak ' Shared "
The good: This food is low in Sodium. It is also a good source of Thiamin, Vitamin B6, Pantothenic Acid, Phosphorus and Selenium, and a very good source of Protein, Riboflavin, Niacin, Vitamin B12, Iron and Zinc. Cooked Caribou: Fairly similar Nutrition Facts.